We’ve all seen the numbers. Measured by any metric: dollars invested, numbers of participants, and average deal size, seed funding is through the roof. Not only are rising numbers of startups setting up and getting seed funding, but the proportion of startups that raise seed funds from outside investors has also increased. There were 1,843 seed deals in 2013 versus 1,749 in 2012 and 1,065 in 2011. From 2010-2013, the median deal size of seed financings went from $800,000 to $1,3 million, as the number of startups raising “seed” financing of at least $3M spiked from 309 to 843. Over the same period, the number of traditional VCs who invested in seed rounds nearly doubled. AngelList, Funders Club, incubators, accelerators, micro and corporate VCs, and dedicated seed funds have all played a role. Newer funding vehicles introduced in the last few years, such as Series Seed Preferred that can accommodate larger funding amounts have supported the increased deal sizes. And of course, the dramatic ratcheting down in costs to start a business: from hardware, to real estate, to user acquisition, mean there’s been a dramatic drop in barriers to entry for starting up. 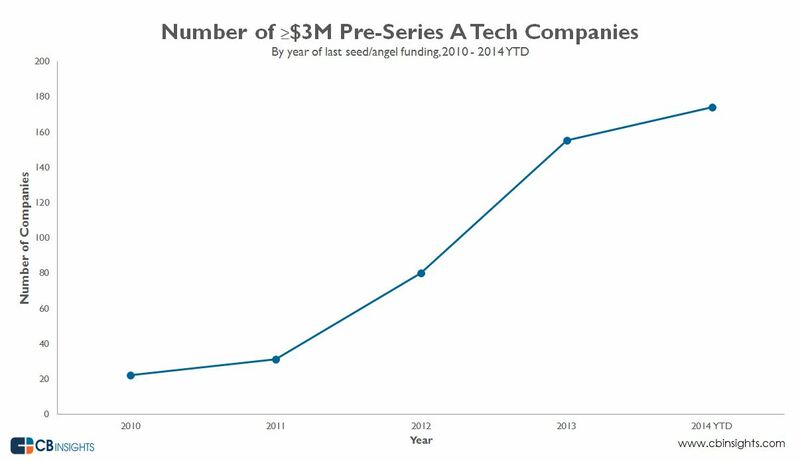 Meanwhile Series A rounds have been relatively stable in terms of investor numbers and deal size. Series A deals totaled 843 during 2013 and 692 in 2012 (down 2% from 2011’s number) Source: CB Insights. The upshot is that a rising number of companies that sailed through their seed rounds ultimately fall flat when they try to move on to an A round. As the amounts raised in seed deals now often equals that traditionally seen in A rounds, investors expect startups to be further along the path to monetization when it’s time to raise the next funding round. In other words, the metrics, traction, and growth trajectory required to complete an A round are now higher, even as the price entrepreneurs pay in terms of the share of equity they give up, has fallen. But to call the impact on Series A funding a “crunch” is a misnomer. Unlike in a credit crunch, when lenders drastically cut back on financing activity, the so-called “Series A crunch” is simply a function of many more startups competing for institutional funding. Ultimately, the relevant question is whether a lack of sufficient investment in A rounds is causing large numbers of potentially successful businesses to be passed over for funding. The evidence for this being the case is just not there. What’s actually happening is a winnowing process where only the strongest business models with demonstrable traction in terms of revenue, users, and market share momentum can get follow-on funding. I think this raising of the bar is ultimately a good thing for the startup ecosystem, as startups that can attract funding will be the best positioned for long-term success. What funding trends are you seeing? Tell us in the comments section below or contact us at Early Growth Financial Services for a free 30-minute financial consultation.